Then, to my surprise, the name of Louise Mack cropped up again in Sue’s Monday Musings at Whispering Gums! As Sue says, Louise Mack is hardly a household name so this is synchronicity indeed. Well, like many bloggers Sue is tackling her TBR, and her first book of 2017 is a novel by this same Louise Mack (1870-1935). 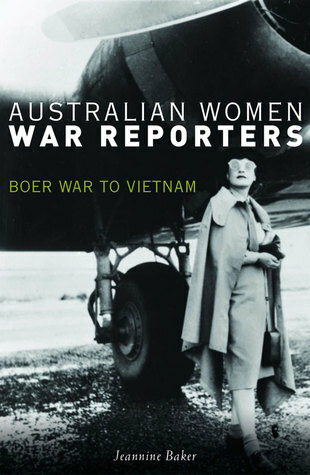 Sue’s introduction to this enterprising woman is full of all sorts of interesting snippets, but Jeannine Baker’s profile is a bit different because her focus is on the experiences of Australian women war reporters during World War II. Baker’s PhD – which won the Dennis-Wettenhall Prize for the best Australian history postgraduate thesis at the University of Melbourne – is the subject of her book, and so it is Mack’s experience reporting on WW1 which is the focus of her attention. In addition to these difficulties, all sides apparently considered women to be spies who were therefore adding to the dangers for other journalists as well. Still, Mack managed to get hold of a vehicle, and then made her way by train ‘into the very heart of German ruin and pillage and destruction’ and on to the ransacked town of Aerschot. She travelled through the German lines to occupied Brussels where she visited the devastated town of Louvain and eventually returned to Antwerp. And like her fellow Australian journalist Frank Fox she was determined to stick it out rather than head for safety. Mack, Fox, and Lucien Arthur Jones of the Daily Chronicle took shelter in the cellar of the Wagner Hotel. According to Fox and Jones, all three escaped Antwerp on Friday 9 October, just as the Germans entered the city – Fox and Jones in a motorboat, and Mack via a Red Cross motorcar. In her book A Woman’s Adventures in the Great War, Mack claimed to have walked the empty streets, the only noise the terrified howling of deserted dogs. According to her account, she then disguised herself as a mute maid to avoid detection by the occupying Germans while she witnessed the invasion, eventually being smuggled out, disguised as a peasant, on a false passport, arriving in January 1915 back to England via Holland. Mack’s book and her subsequent public lectures contained exactly the sort of anti-German propaganda commonly printed in Northcliffe’s newspapers, with emphasis on the bravery of the Belgians, the ‘companionship and comradeship’ at the front and the Germans’ brutal desecration of churches and women. The events Mack depicted did not reach the depths of some of the commonly repeated atrocity stories of the time, but she undoubtedly embellished events and her participation in them to whip up patriotic fervour, encourage volunteering and ensure publicity. Later on in 1919 she even dressed in a nurse’s uniform and claimed to have been in Belgium as a worker for the Voluntary Aid Detachment. Mack also claimed to have met with wartime heroine Edith Cavell in prison in Brussels in 1915 when it could not possibly have happened – because Mack was back in England in January, many months before Cavell was arrested in August 1915. Baker seems disappointed in Louise Mack, and so am I. At a time when women were struggling to get recognition as serious journalists, she seems to have let her gender down. Australian Women war Reporters is a terrific book. I’m about half way through and hope to be able to write more about it before the book is due back at the library in *oops! * three days time. Adele (Tilly) Shelton-Smith, who unwittingly caused a furore when she reported on the AIF based in Malaya before the Fall of Singapore. Officially restricted to reporting only on non-operational issues, her story for the Australian Women’s Weekly offended the troops because it didn’t conform to the Anzac Myth. She praised their physicality and stressed their exemplary behaviour (which wasn’t entirely true since there were widely reported allegations of offensive conduct and a ‘generally boorish attitude’ towards the local Asian population). But her stories intended to reassure families back in Australia that the troops had ‘all the comforts of home’ and were in good spirits backfired when they were accompanied by photos of soldiers with taxi-dancers and there was an unholy uproar, which influenced future reporting considerably. (See her entry at Trove). When Dorothy Jenner reported from Singapore, she was sure to distance herself from the Women’s Weekly brouhaha, and the army, having thought better of their rules for reporting, allowed her to go out on rugged training exercises which earned the respect of the troops. She was subsequently interned in Hong Kong and at the risk of her life, kept a clandestine diary about military developments in the area as well as observations of life in the camp. (See her entry at the Australian Women’s Register). Accredited female war correspondents from 1942 onwards, and the restrictions on their movements. There were three categories: those in operational areas (men only); Lines of Communication Correspondents who worked at the HQ of their newspaper (nearly all women), and Visiting Correspondents with temporary accreditation and forbidden to travel to operational areas. The women in this group reported on women in the services which had been formed in 1942 because of the critical shortage of men. (It’s easy to forget that Australia had a population of only about seven million at this time). Much of this reporting had propaganda value in encouraging more women to join the services. While reporters such as Rita Dunstan felt a bit miffed that they were restricted to reporting from the home front, they also felt privileged by being allowed to travel interstate when there were restrictions on internal travel. More importantly, these reports showed women succeeding in occupations that were hitherto ‘men’s jobs’, such as helping to guard the coastline and operating anti-aircraft instruments. Connie Robertson refuted the sexist notion that women couldn’t be trusted with sensitive information while Patricia Knox similarly stressed the reliability of women plotting the movements of RAF aircraft. Censorship meant that the style of reporting in final copy tended to be a bit anodyne and it’s not surprising that they were satirised by Iris Dexter alias Frenzia Frisby’. (You can read more about her in this edition of the State Library of NSW magazine). Lorraine Stumm was the one Australian war correspondent who made her way close to operational areas, and she did it via London. She was a reporter for Daily Mirror and working on an equal footing with the men when her husband – an Australian pilot flying with the RAF – was posted to Singapore. She went too, though she didn’t have any luck getting near the front. Evacuated with her baby daughter in January 1942, she got nowhere with Australian authorities so she bypassed them and got accreditation through the Daily Mirror office in London. But even when she made her way to New Guinea, she had to sit back at base cooling her heels while male correspondents accompanied Allie Forces on their missions. Still, she paved the way for Alice Jackson but she was the last woman accredited during WW2 because Blamey abolished the licensing system. (See her entry at Trove). There is a whole chapter on correspondents in Europe where they faced similar restrictions until December 1941 when the US belatedly joined the war. They allowed women to be accredited, providing access that the Brits had denied. In 1944 the British finally caved in but no women were supposed to go anywhere near D-Day (though two American women did). This is a really interesting chapter showcasing the battle between official attitudes and the determination of women to be treated as equals. There is also discussion about the complexities of writing from the ‘women’s angle’, i.e. ‘human-interest stories (because that’s often all they could get access to) as against political stories about the impact of war on civilians. They came into their own when reporting on the post war refugee crisis and the Holocaust, humanising it in a way that more ‘objective’ male reporters tended not to do. Narrowing the Gap, reporting from Asia, 1945-46. This covers conflicts from Burma to the Korean War and Vietnam, and the tensions that arose as women gradually moved into forward zones. Baker also reveals the story of Dorothy Cranstone whose work in Burma has largely been unrecognised because she had no by-line for her reports and wasn’t officially accredited. Cold War Conflicts… and Beyond – which includes the emergence of women reporting on radio, and the appointment in 1983 of Helene Chung as the first female foreign correspondent (in Beijing) for the ABC, and Monica Attard’s world-renowned reportage of the fall of communism in Moscow in 1991. This chapter also explores more recent reportage by women, such as Irris Makler in Afghanistan and the particular challenges of reporting in a culture where women are ‘invisible’. This is a really interesting book which will be of interest to journalists, historians and anyone interested in women’s writing. Update 30/1/17 Dagny from Madame Vauquer’s Boarding House has posted today about Mary Roberts Rinehart, one of the first American women to post ‘from the trenches’, and there’s a link from Dagny’s blog to the Gutenberg link where you can read Rinehart’s book, Kings, Queens and Pawns: An American Woman at the Front. Synchronicity squared! I’m reading this book (because you mentioned it to me) and I too noticed Sue’s mention of Louise Mack. I have a bit more than 3 days to finish it, but you’ll beat me nonetheless. I was interested in Sue’s mention of Louise Mack because as part of the Heidelberg Historical Society newsletter, I write a ‘Hundred Years Ago’ column about life in Heidelberg in 2016-17. I’ve been interested by the women speakers who came to speak in 1916 to the women’s groups attached to the Red Cross or to local churches (largely interchangeable in Heidelberg) and I wondered if she was one of them. The pages about her don’t mention anything about that, but maybe there will be something in the references at the back of the book? It’s a great book, yeah! This is very funny isn’t it! Sounds like a fascinating book, Lisa. I’ve actually had war correspondents on my possible Monday Musings list – the list I look at every now and then when I need inspiration – but I haven’t had enough info to do anything on it. Now there’s the possibility of doing one on males and one on females. One day. Janine, she went to many many places, and raised money for the Red Cross, but I can’t see Heidelberg in Trove. I did see Yea, and Dubbo, and Perth, and Ulverstone, to name a few, when I was looking on Monday, but I gave up eventually because the reporting was all the same (clearly using a press release). I wonder if the Red Cross has records? I think she was, in her way, a bit like Eliza Frazer. According to Larissa Behrendt’s book Finding Eliza, Frazer embellished and exploited her experience with lecture tours that became ever more audacious about her exploits and ever more racist about the ‘savages’. But as you say, Mack was a survivor, and if like Frazer, she found that gilding the lily was a way for a woman to make a living, well, it’s hardly surprising. After all, didn’t even Manning Clark invent things about his war time experience? What storyteller doesn’t is perhaps the real question! Don’t forget ‘my’ Miles Franklin who reported on the effects of war in London in 1915-16 before serving in Macedonia with the Serbians and reporting from there. Well, yes, but if you consider that at the time she was competing with the reportage and memoirs of the soldiers who had actually been *fighting* at the front, maybe she felt she needed to jazz things up a bit to get her head above the parapet. I am also interested in these amazing women. The young Katherine Susannah Prichard was a courageous young Australian woman who lived in the slums of London and also the amazing Molly Skinner from WA who spent time in India nursing the war wounded. So much to discover about these feisty Australian women writers whatever genre they chose. Fay, you will be pleased to know that Nathan Hobby is hard at work on an exhaustive PhD about KSP and I am rather hoping that he pops up here to tell us more about her. This month I will be researching KSP’s trip to report on a war hospital in France in December 1914. As you may know, Fay, she wanted to report from the front and when the editor refused that, tried to join the women’s auxilary corps. The hospital trip was third choice for her, but still brave! I didn’t know about Mollie Skinner’s service – how interesting! Mollie Skinner wrote a novel about her war service called Letters from a V.A.D. Yay, Nathan, good to see you here:) I will do my best with my review of this excellent book but I really think you need to read it yourself because it’s very good on the context of women war reporters – the hurdles they faced and so on, but also the way they were expected to report on things ‘from a woman’s POV’ rather than on military matters. Also, from reading Kitty’s War by Janet Butler, it’s also important to note that nursing staff close to the front were also in serious danger, from gassing, shrapnel and sometimes artillery and bombs. Some of the died, and some of them were badly injured but there was little fuss made about this because the women didn’t want to be stopped from participating. Thanks Lisa, I have just finished reading this book today. An excellent read. So many fights and battles these women had to face just for some recognition to be writers. I admired how some of these women were so determined, and even reached their aims. Though, I think the nurses on the front line were the most courageous of them all. Yes, having read Kitty’s War, where so much danger was left unsaid in her diaries, I’d agree.